We have had many Grinters asking the same questions over a long period of time. For example, “Why is my Golf Handicap so low if my Score Average is around 88?”. So, here you go, this is short and sweet what you need to know about the Handicap System. To begin, you should know that the Handicap Index is intended to represent a golfer’s potential ability. Therefore, it is not calculated using the Score Average. The Handicap is calculated using the Handicap Differentials of your best rounds. And there is your Golf Handicap Index! Just in case you don’t know what ESC is, the USGA establishes a maximum score per Hole, so the Total Score after applying those Maximums is your ESC (at the bottom of the blog we show you the ESC “Equitable Stroke Control” Guidelines). What if you have less than 20 Rounds uploaded? And how do you know the ESC Score? 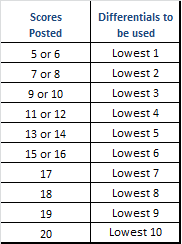 You have to use the below table to limit the max score allowed per hole. But remember, we do all those calculations automatically. All you have to do is upload your Scores to your TheGrint Account. We do the rest. To show you an example, we will use Mr. Bob Grint’s scoring record! 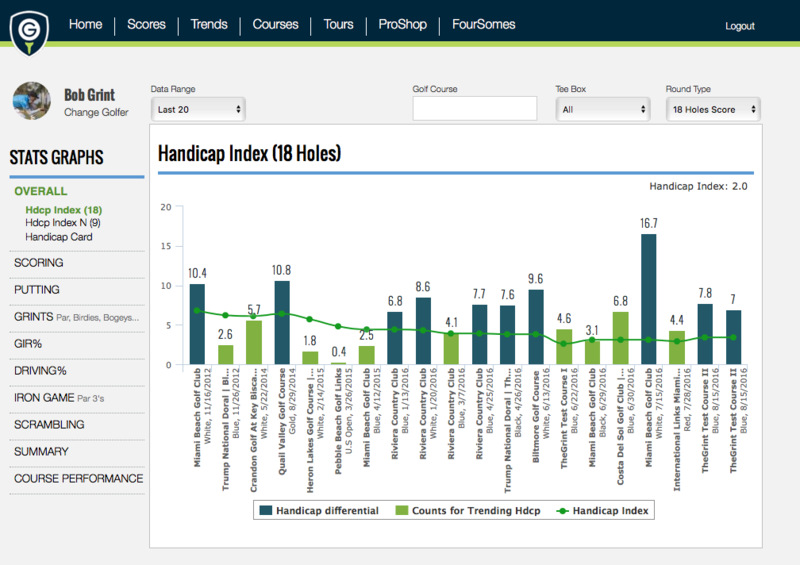 The easiest way for you to see the Scores that are being used to calculate your Handicap is to go to the Trends Section on the Website and see the Green Bars (those are the lowest Handicap Differentials out of all of your latest Scores). His Handicap Index is 2.0 (pretty good, right?). At the end, you don’t have to know all this, we do the work for you anyway… so, all you have to do is upload your Scores or send them to us through the SPS Service and we will upload them for you (learn more about the SPS Service here). This entry was posted in The Handicap System, TheRange Blog and tagged golf, golf handicap, golf handicap differential, handicap differential, SPS, TheGrint. Bookmark the permalink. 12 Responses to How Is My Golf Handicap Calculated? I use the Grint App on my iPhone. Is there a way to enter more information than just the ESC score and post? I would like to also enter in greens in regulation and putts. Hi Steven, good afternoon. Sure. You can upload your Score, plus Stats and Putts. 4. Then choose the option you prefer to search for the Course you played or going to play. 5. Then Select the Date, Tees and Stats you want to Track at the bottom. Make sure you select Round = Front 9 or Back 9 if you play 9-holes. 6. Then swipe the screen to the Left until you get to the 1st Hole. 7. Tap on the Grey Circle to Add the Score (putts, stats and penalties if you want as well). Then swipe to the Left to continue to the 2nd Hole. 2. Click on Scores (on the Top Menu). 3. Then click on “Add Score” (on the Right hand side). 4. Then type the name of the Course, make sure you have the Date when you played, not when you are uploading the Score (this way your Handicap will be more accurate). 5. Then select a Tee and upload the Score (also the Putts, Stats, and Tee Accuracy if you want on the boxes below). Make sure you select Round: Front 9 or Back 9. 3. Click on Add Score (On the Right hand side). 4. Fill in all the information (Score, Putts, Penalties and the Fairway Accuracy). At the bottom when you are on the Penalties or Fairway Accuracy boxes, you will see the Legend on what to write depending on what you had on that hole. For example, if you went in the Water on the 2nd Hole, you will type a “w”. If you went in the Water and then the Sand Trap next to the Green you will type “ws”. After you submit all the information, Click on Submit at the Bottom. To upload a Score through the SPS Service, through the App (Scorecard Picture Service), follow these steps: This is a Pro Feature. 4. Select the Course, date, tees and Tracking Options. 5. Then continue and then select “Camera”. 6. Then select if you want to take Two Photos (one for each side of the Scorecard) or just One Photo (the whole Scorecard). 7. Take the Photo/s and then tap on Upload. We will receive your Scorecards and upload your Score as soon as we receive it. Click here to see how to write down your Score and Stats when you use the SPS Service. SS means that you hit the Greenside Sand twice. FF means that you hit the Fairway Sand twice. DD means that you had to drop the ball twice (because of unplayable or anything like that). FS means that you hit the Fairway Sand and then the Greenside Bunker. OS means that you hit it Out of Bounds and then you hit it into the Greenside Bunker. I am unable to access my “handicap card”. What do I have to click-on in order to access it? Also, if I wish to email a current “handicap card” to a fellow player how do I do it? Please e-mail at contactus@thegrint.com so we can help you. We will be waiting for your e-mail. Great job guys and gals . much appreciated. How can we get other scoring types like stableford? Is there any? You can use the Games Feature to play Stableford or any other type of Game. You would keep your Gross (normal) Score, as well as the Stableford. You can read how the Games Feature work on the Blog about the Games Feature. Contact us through contactus@thegrint.com if you have any questions. If you are just getting started using the Grint, when do you start to apply your ESC scores if you haven’t established a Handicap Index? 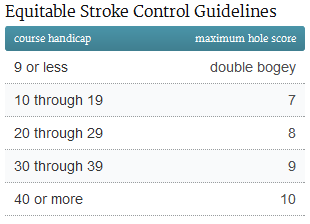 Without a Handicap Inex, you can’t calculate your Course Handicap, meaning you can’t figure out your ESC because you don’t know how many strokes you are allowed per hole. Please help! Hi Kyle – Thanks for your question. It is actually a good one, and that is why we ask for your approximate handicap when you registered. We use that as the starting handicap which we will use for ESC purposes. If you did not enter a starting handicap we assume 36 as default, until you enter your first score. We hope that helps. Please email us at contactus@thegrint.com if you have any additional questions. Is there a way to post combined nine hole scores to make a 18-hole handicap (like a manual entry that we can combine scores and post)? This is how the USGA records scores for handicapping (Section 5-2c and d). Looks like the Grint keeps these separate and posts 9 and 19 hole scores to create individual handicaps. How is that useful, as a 9-hole index is not used for any USGA golf far as I know. We actually do have the Combined Scores Tool. The Combined tool is available on the Website. Go to Scores, then click on Add Score. Then click on Combined 9 Scores. There you will be able to upload the Front 9 and Back 9 for your New Combined 18-hole Score.